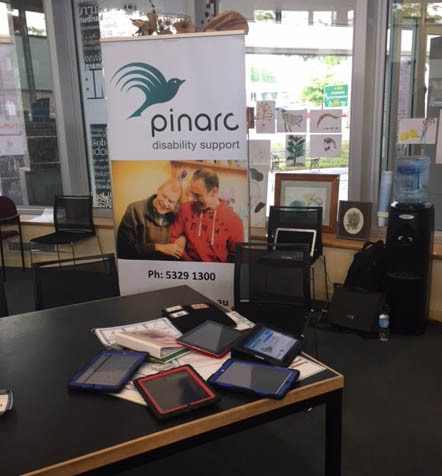 On the 24th of November, Grampians Regional Communication Service was invited to attend the Ballarat Digital Hub Adaptive Technology and Apps Event at Central Highlands Library. This was a new initiative which saw providers from Vision Australia, Hearing Australia, Yooralla, SCOPE, Quantum and Pinarc Disability Support come together with trade displays and be available for individual consultations or information sessions. Grampians RCS took up this fantastic opportunity to promote the use of both high and low technology for people with complex communication needs. It further allowed us to network with other agencies from not only around the region but also state and nationwide. On the day Grampians RCS was able to showcase various examples of communication apps for the iPad including speech generating apps, choice making apps, and scheduling and timetabling apps. We also had many people interested in the recently released Tools 2 Talk app to assist them in generating visual supports. It was great to see many family members of people with communication difficulties attending to explore the wide range of apps available. The central highlands library staff rated this expo as being successful and reported they would like for it to be established as an annual event in the future. Grampians RCS are currently in talks with the library about how they can further support the use of technology for people with communication difficulties including technology being freely available in the library with particular apps for the community to trial. This entry was posted in Uncategorized and tagged Grampians RCS, Grampians Regional Communication Service, technology, Vision Australia on December 22, 2014 by crcscope. Carl is a very intelligent, inspiring gentleman who lives in Tatura. He has not been able to talk for some years now as the result of a brain injury. Carl’s Lightwriter is his voice – a small, typewriter like device that converts text into speech. 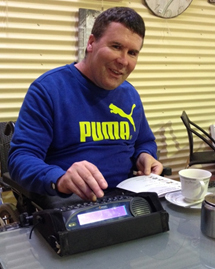 We were fortunate to meet Carl through Cuppa and Conversation, a group for people living with communication disability held in Shepparton. Carl very kindly spoke with us about the advantages and disadvantages of living in a small community, his “love/hate” relationship with his Lightwriter, and the challenges of living with a communication disability. This entry was posted in Uncategorized and tagged communication disability on December 16, 2014 by crcscope. My name is Zarah Lont, I am currently based in Warragul and have begun working in Regional Communication Service in June 2014. I am a new grad Speech Pathologist, finishing my studies at Charles Sturt University in 2013. So far being part of the Communication Access Network has been an eye opening experience. I am finding the work of CAN highly rewarding. At university, the focus of studies was individual therapies. Being exposed to CAN while on a fourth year placement and now working in the position has given me a an appreciation of the range of supports and education that is in the role of a speech pathologist. In the few months that I have been in the RCS position, I have made wonderful friendships and connections. 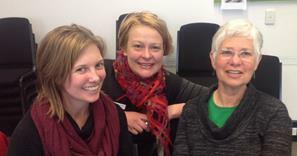 The Gippsland RCS team including Bernie, Mel and I can’t forget Chris have been so supportive in helping me settle in. As a team we recently delivered an Accessible Written Information Workshop, which was highly successful. This was a great introduction for me about delivering training using a community capacity building approach. I have been involved in supporting a number of individuals and the people that support them. I’m discovering the amazing variety of communication resources around, and finding it rewarding being able to share these to enhance participation for individuals. Overall I am very excited and enthusiastic about continuing to work as part of CAN. The short journey so far has been wonderful and I can’t wait to continue to develop my skills into the future. I know my work so far is only a small aspect of the role, so I am anticipating that as I discover more, I will only grow into the role even more. I am hugely grateful from the overall support I have received within CAN, it really is a fantastic network to be part of. This entry was posted in Uncategorized on December 5, 2014 by crcscope.